There are those who work for months or even years to create a beautiful tiny home out of nothing, but if you don’t have time for all that, now you can order your own ready-made Mobile Home. The compact structure, designed by Ruzanna Andressa Oganesya, is built on a moving platform and can be transported virtually anywhere. Those looking to go off grid hassle free can order it to be delivered to their desired location, ready to use as a serene mountain retreat or even as an urban home addition. The Mobile Home is a prefab modular construction that is wide enough to fit on a freight-liner truck bed, making delivery ultra-convenient. The home is compact, approximately 150 square feet, and comes with all of the basic necessities, including a selection of furnishings. The compact house is a unique shape, almost completely covered in glass panels. Adding to its charm is a lovely open-air deck that leads into the interior. On the interior, a mezzanine floorplan allows for optimal use of space. 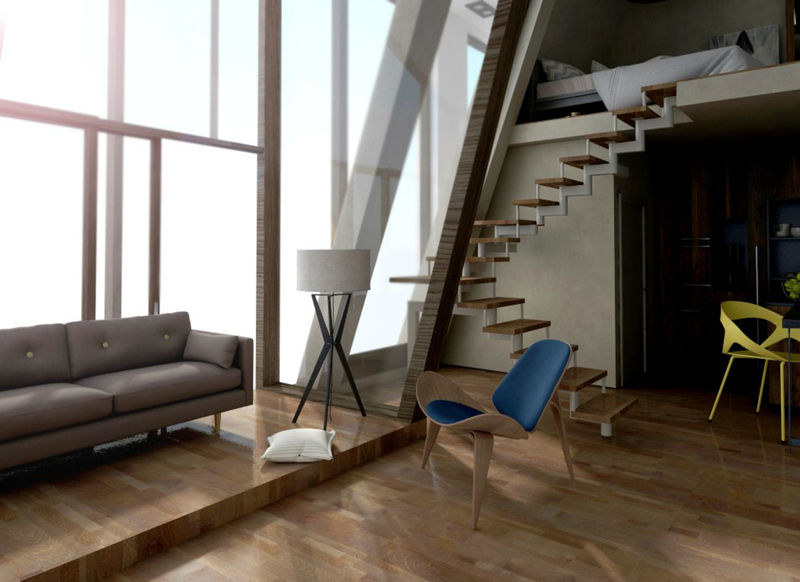 The bedroom hovers over the living space connected by an open staircase. Along with the glass walls, a skylight floods the home with natural light. Strategically located just over the bed, it allows residents to enjoy a bit of stargazing as they nod off to sleep. i would like more imfo on these houses. its what i want but a lil bigger.how much are these homes? Looks like a good design for a commune: everyone has their own little place, and you could have a communal one for cooking, socializing, etc. I want to buy one and put in my farms in India. "approximately 150 square feet" That looks a lot bigger than 10' by 15'. Awesome how do you order one? Yes, please give us a link or tell us how we can order one of the magnificent homes. Awesome you don't deliver Tasmania, Australia huh? HOW MUCH DOES THIS COST,,,,IS IT ONLY OFF THE GRID,,, IS THERE DIFFERENT FLOOR PLANS, ? Very beautiful, but the price ? Yes, how do you order? What is the cost and time frame for construction? how do you order one? There are those who work for months or even years to create a beautiful tiny home out of nothing, but if you don't have time for all that, now you can order your own ready-made Mobile Home. The compact structure, designed by Ruzanna Andressa Oganesya, is built on a moving platform and can be transported virtually anywhere. Those looking to go off grid hassle free can order it to be delivered to their desired location, ready to use as a serene mountain retreat or even an urban home addition. The Mobile Home is a prefab modular construction that is wide enough to fit on a freight-liner truck bed, making delivery across the globe ultra-convenient. The home is compact, approximately 100 square feet in total, and comes with all of the basic necessities, sans furnishings. The home is a unique shape, with almost completely covered in glass panels, with one large wall looking out over an open-air deck. 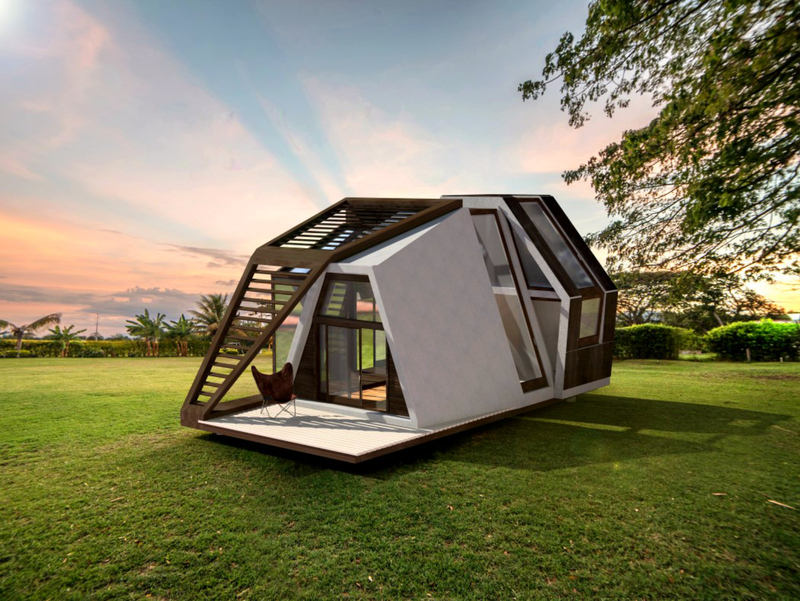 The Mobile home is a transportable tiny home.